Jared Diamond, author of Collapse: How Societies Choose to Fail or Succeed, wrote a (rather negative) book review of Questioning Collapse: Human Resilience, Ecological Vulnerability, and the Aftermath of Empire – a critique of his own book – for Nature (the journal, not the magazine)… without mentioning that Questioning Collapse was, well, questioning Collapse. Sound shady? We think so too. Many thanks to StinkyJournalism.org for laying out this conflict of interest and bringing its high functioning nonsense detector to a good old fashion media ethics debate. In Questioning Collapse (which, while we’re on the subject of ethical disclosure, happens to be a Cambridge University Press title), an impressive group of historians, archaeologists, and anthropologists marshal the latest scholarship to present an alternative theory of societal failure and the nature of collapse. From Easter Island to ancient Mesopotamia, the collection submits radically different analyses of iconic events. Learn more about the ethical and factual mistakes that contributor Carl Lipo thinks Jared Diamond made on Lipo’s blog, Evolution Beach. EXCLUSIVE: There are many things that writers, and the publications that publish their work, can do to lose the trust of readers. One is to write about subjects that present clear conflicts of interest. Another is to fail to be transparent about those conflicts with their readers. The February 18 issue of the journal Nature provides a clear case in point. In the issue, Pulitzer-winning scientist Jared Diamond reviews a book of essays called Questioning Collapse: Human Resilience, Ecological Vulnerability, and the Aftermath of Empire. The review, “Two views of collapse,” is largely negative. What Diamond doesn’t disclose to the readers of the review, however, is that Questioning Collapse is not just a book about “collapse”… It’s a book about his bestselling book Collapse: How Societies Choose to Fail or Succeed. Even more, it is a book of essays directly criticizing and critiquing Diamond’s own work and writings. This may not be the only time the subject of a critical work has reviewed the book that critiques them. But, by failing to disclose that Questioning Collapse is a critique of his own research, Diamond misleads readers into viewing his book review as something it is not–the dispassionate opinion of an outside observer. Diamond–the subject of several StinkyJournalism investigations into errors and ethical lapses in his reporting on Papua New Guinea, and of a libel lawsuit by Daniel Wemp, the single source for his New Yorker essay “Vengeance is Ours”–is the author of Collapse: How Societies Choose to Fail or Succeed. 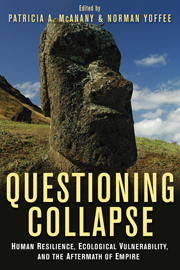 Questioning Collapse, published by Cambridge University Press, features a group of essays collected from and after a meeting of the American Anthropological Association that were directly intended to address “issues swirling around the popular writing of Jared Diamond.” The essays critique specific passages and arguments of Diamond’s book, as well as argue against the more general themes of human history Diamond describes. Yet, Diamond’s review in Nature, a prestigious journal of science and medicine, makes no mention of this. It might, then, appear to a reader of Nature with no prior knowledge of his relationship to the book under review, to be the opinion of an independent expert. Given that Questioning Collapse is a refutation of his own work, Diamond cannot be considered as such, and he is ethically responsible not to–purposefully or accidentally–masquerade as such.